Zoos are controversial. They keep animals in cages, there are antidotal stories of mistreatment, and some people are challenging the overall philosophy and value of maintaining animals outside of their native habitat. And in the world of photography, there are lively discussions about photographing zoo animals. “Any photo of an animal in a zoo should be clearly labeled to not lie about the photo’s providence.” I’m good with that. Others think a photo stands on its own with or without labels. I’m not entirely sure about zoos, but I did like my visit to the KL Bird Park in Malaysia, and I liked an opportunity to get up close and photograph birds. Over 3,000 birds, 200 Malay and other world species, fill the twenty-one acres. That’s a lot of feathered friends. 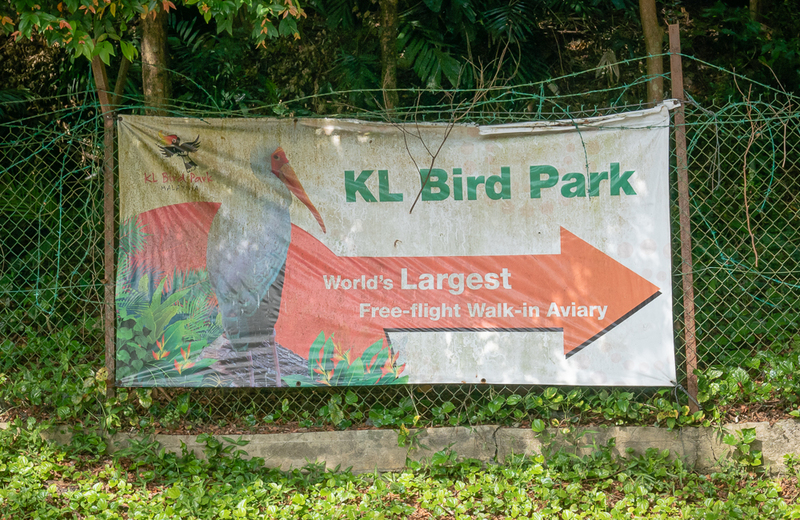 The KL Bird Park is the “Worlds Largest Free-flight Walk-in Aviary.” It opened in 1991. 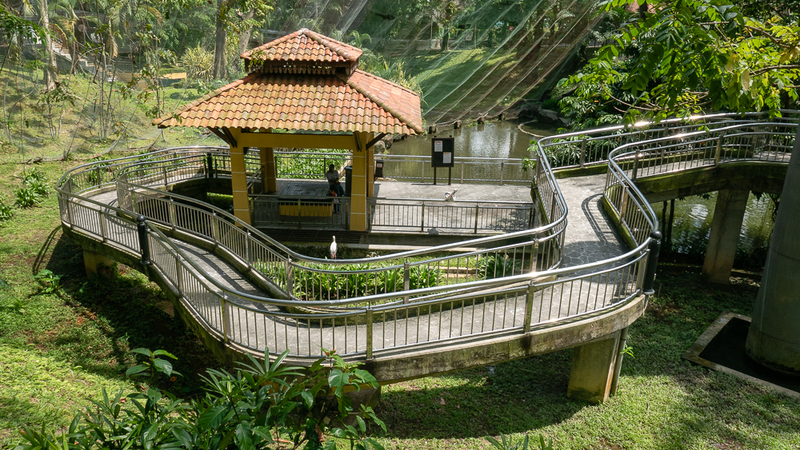 Only 20 minutes from the city center, the 21-acre park is adjacent to the KL Muslim Museum and the Kuala Lumpur Botanical Gardens. There are a lot of tours that will take you to all three, but we went on our own. We found the entrance fee more expensive than other attractions, but an excellent value by western standards. Mr. Stork looks like he has his legs on backwards. And, it has birds! How could we pass it up? They start you out with parakeets and peacocks right at the entrance. This is a bird appreciation experience. There are plenty of domesticated species, but there are also local species that can be tough to find in the wild. I liked what I would name “The Wall of Owls.” About 8 different owl species were quietly napping on perch and in boxes. They were beautiful. But, there was no cage around the owls, and I wonder what was keeping them all together neatly arranged in boxes and on stands? Maybe zoos are such nice places the birds don’t want to move? Or maybe their wings are clipped. Cattle egrets are scattered in all four zones and they seem to like hanging out with people. They aren’t begging, just standing, and I think they are watching us. I believe there is more going on behind those little dark eyes. Some of the walkaways within the KL Bird Park. The nets above, supported by large pole structure is impressive. Large tropical trees that apparently have been here for a while extend beyond and above the enclosure. We walk under a constructed waterfall and long meandering paths. It is tropical hot, so we try to stop only in the shade, and we take cover in an air-conditioned room that is used for school children. There are snack bars scattered around the park, a restaurant inside the hornbill section, and you must exit through the gift shop. We missed it, but the brochure also identifies a “Prayer room next to the Main Entrance.” I haven’t seen that in a zoo before. Mid-day, we walked past the ostrich enclosure, and we could hear the call to prayer from the near-by National Mosque. One of my favorite things was the room filled with friendly red lories. They were so cute with beautiful colors and seemed to like people. If you don’t like birds (then what are you doing here), it could be intimidating to have them jump on your head and sit on your shoulder. 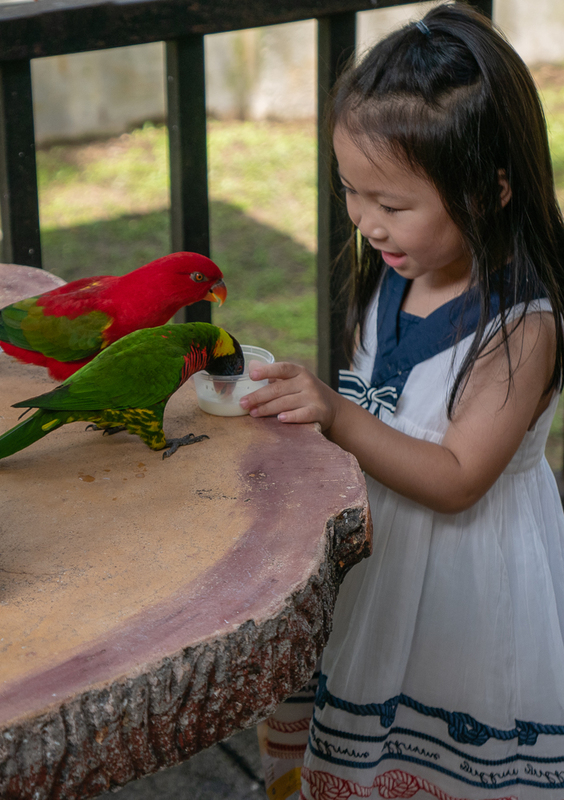 At first, it seemed too commercial, feeding the cute little lories, but everyone loved it. Anything that endears people to birds is a winner in my book. Maybe it made an impression on a young visitor, and one day that little person will turn into a big person who will make a decision to support birdlife. Small actions make up big choices. My favorite birder is making new friends. Children and big-time birders like feeding the lories. After seeing birds under a net, we went out to the open and walked through the KL Botanical Park. The quiet of the park contrasted with the busy bustle of the surrounding city. The gardens were mature, and I especially liked seeing the old cycads that displayed both male cones and female reproductive structures. 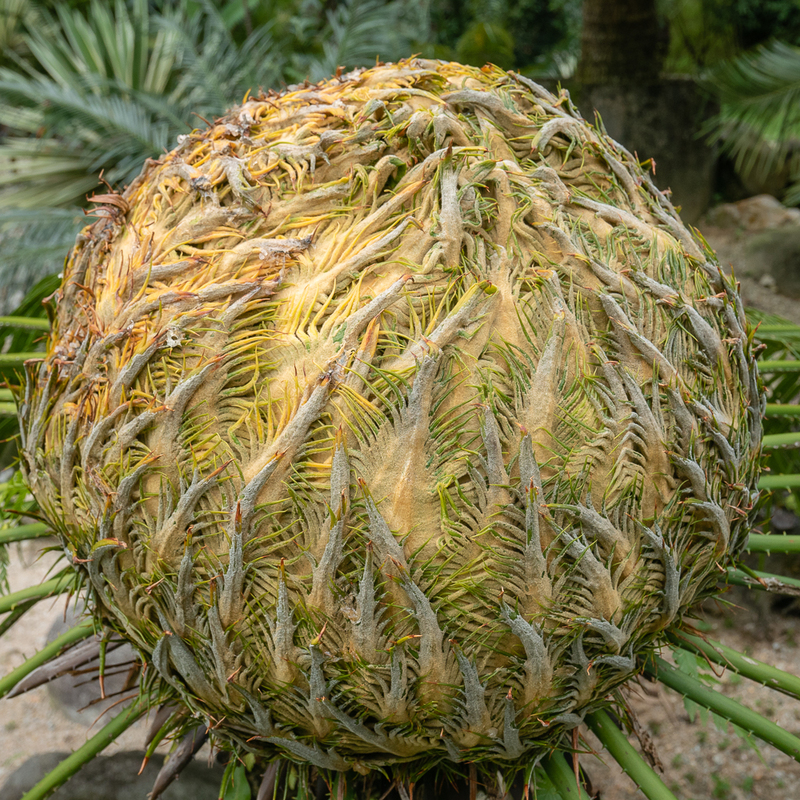 It is hard to believe that in a lot of ways the cycad and the flower have the same function - make seeds. A couple having a personal moment in the KL Botanical Garden. The park in Malaysia is halfway around the world from our home in Olympia, Washington, but once again we were reminded that there is a universal appeal of a beautiful bird, an appreciation for wildlife, a need to connect with other creatures, and an interest in conservation and preservation of our natural environment. We may disagree about the value of photos or zoos or birds. We may have different values, goals, likes, and dislikes. But after visiting the KL Bird Park, I think we are all just birds of a feather, just trying to flock together.